To the increasing disorders we associate with obesity, all our attention has been taken away from trying hard to put on weight. You may think losing weight is the hardest task, but have you asked an underweight person how hard it is to put on weight too? A person with a low body mass index (BMI) will also be putting in the same effort to gain weight. The term underweight is applicable to a person with a BMI less than 18 (Normal range -> 18 - 24.9). 1. An intake of food that is insufficient in quantity to meet activity needs. 2. Poor absorption and utilization of food consumed. 4. Psychological or emotional stress. 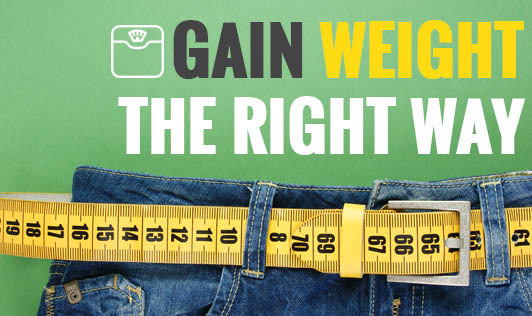 A thorough family, physical and diet history with medical tests will help determine underlying causes of underweight. A wasting disease or mal-absorption of nutrients requires treatment. Physical activity should be modified and psychological counseling should be started if necessary. Nutritional support and dietary changes are effective with, or after treatment of the underlying disorder. Usually, dietary changes include prescription of a high calorie diet apart from correcting loopholes in dietary habits and nutritional intakes. Instead of hastily planned meals, eating at scheduled hours would be better. Meal times should be relaxed, as nervous tension often contributes to underweight in some individuals. Increase in calories should be done gradually to avoid gastric discomfort and periods of discouragement. Though fatty foods are rich in calories, they take longer to digest. It is preferable to give nutrient dense and easily digestible foods. Being physically active not only helps in increasing hunger, but also helps in defining the right body shape. The underweight person must be encouraged to eat frequently and throughout the day. The secret is to individualize the program with readily available and easy to digest foods that the individual really enjoys. It is important to overcome lack of interest in food and eating. Meals should be colorful and appealingly presented. Above all, it is important that the diet should is balanced and wholesome with appropriate physical activity. Contact your dietitian today to get a personalized prescription. Go to "tools --> request appointment".